A wonderful book of photographs with some additional text and background information. Every now and then you come across a book which is a joy to look at. I say look at and not read because this book is mostly pictures. The text adds a little historical information and tells you who or what the photographs are but in essence this is a photograph album showing a little insight into the life of the women who worked in The Women's Land Army. The Land Army Girls are so often depicted in a glamorous way and it is forgotten just how important for the war effort their work was. The photographs show the variety of work undertaken and gives an impression of the strength and determination they had to carry it out. As I look through the book I can't help looking at the faces and wondering what became of them or what fascinating insights and stories they could give us today. A lovely book crammed full of fascinating photographs. Many thanks to Bob Powell and Nigel Westacott for taking the time to put this book together and of course to the Women of the Land Army some of whom supplied the photographs and stories in the book. Another thank you to Bob Powell & Nigel Westacott for allowing me to reproduce some of the photographs from the book below. 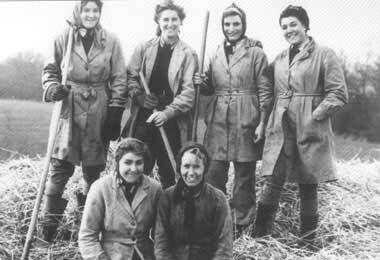 The Kent All-Girl Threshing Gang, March 1944. Back row, left to right: Stella Richardson, Betty Pearson, Nancy Johnson (nee Jarvis), Doris Hawkins. Front row: Doris Dicker, Mrs Olive Bass (forewoman and driver). During the summer months the girls worked on Kent hop farms. 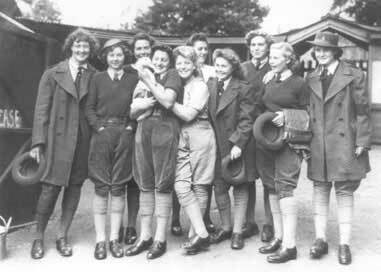 A party of Land Girls wear their best uniform on a visit to Maidstone Zoo in 1943. The day out was organized by the local officer for girls working in the area. Pat Ware (nee Taylor), on the right wearing a hat worked for Mr John Berridge, a Covent Garden Market stallholder who grew vegetables for sale in London on land requisitioned by the Kent War Agriculture Executive Committee. 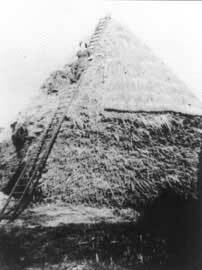 Dorothy Jobson (nee Eade) thatching a corn stack at Dedswell Farm, West Clandom, Surrey. 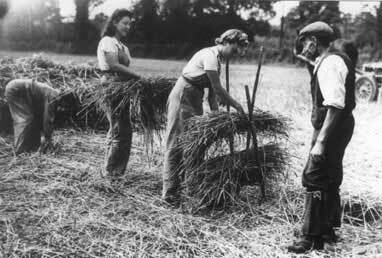 Dorothy worked for Surrey WAEC and did thatching in season. She had been taught by her forewoman who, who had been on a thatching course. Thatching training at Clandon, Surrey, 1943. Kitty Brunton (nee Chandler), and in the centre is Edna Mitchell.